I'm going to go ahead and turn this into my general customs thread c: I'll keep the initial post under the cut just as a future reference, but now that my first is done, I'm itching to do a second, and third, and all of my dolls! I have an Etsy shop set up, and I am interested in taking commissions at some point, so if you're interested in having your own made, let me know and we'll work something out! I added a bit more last night, and now that I have good lighting, realized I sealed in pastels that spread where they shouldn't have gone, so she's likely getting wiped and redone. Hopefully round two will have a better base and colors will stay now that I've had some time to play around with MSC! 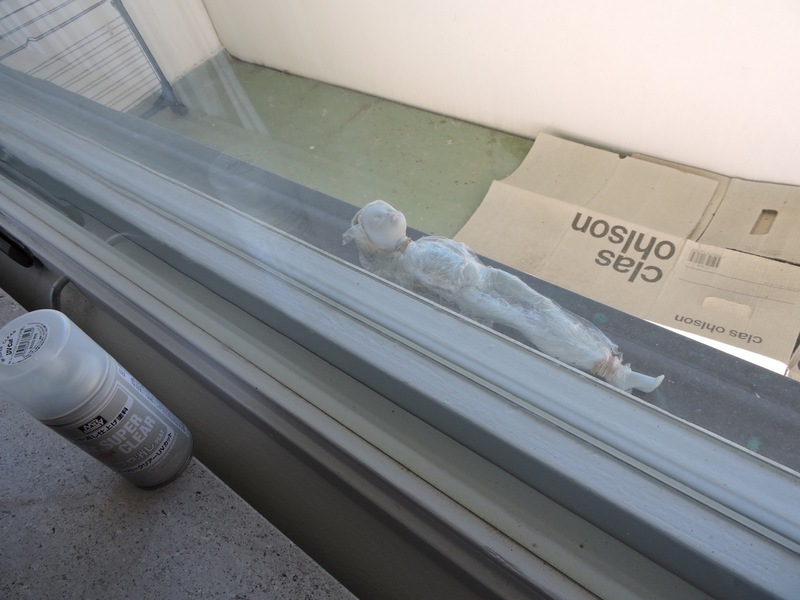 edit: yup, wasn't using MSC correctly in the priming stage and stained the doll, oops. Luckily it's in areas I'd be drawing over anyways, and should be fixable. I've since wiped and redone her, but painted the whites of her eyes with acrylic paint in an attempt to mask the staining, then the pencils didn't go on as smooth, so she got wiped again. Third time's the charm hopefully! Please share some more WIP pics, even of mistakes! I'm still working up to trying a faceup, would love to see errors and how you corrected them and outcomes! Once I get around to it, I for sure will! I'm moving across the world on the 19th, so no time for anything crafty right now! I will say my error with the paints probably came from not watering it down at all, so it built up, wasn't a smooth surface, and left jagged pencil lines. I found a few pictures I took of it, linking below. You can see the staining around the mouth where I sealed in pastels from my first attempt, lol. I only did one layer of pencils and that was enough to realize this run wasn't going to get saved. Always fix mistakes as you go, don't try to cover them up later! Thanks for the pics Simply! And good luck with your move...that's a big one! Okay, feeling really good about the third attempt! 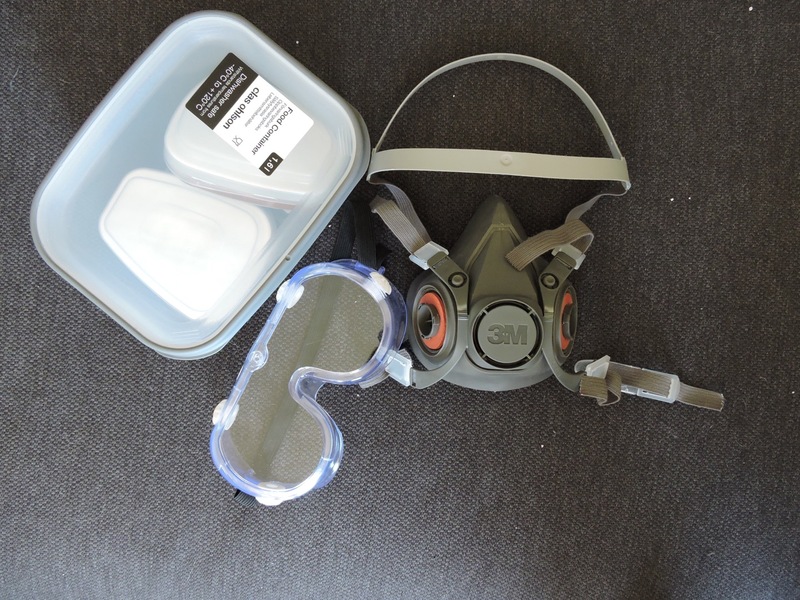 Finally got a proper respirator as well, prior to moving I only had one that was more for painting or sanding, not spraying, but luckily I hardly sprayed so I hopefully didn't do any damage. Always stay safe! I'm keeping the filters in an airtight container when not in use to prolong their life as much as possible. The weather here is getting nice and the extended sunlight hours mean this is a good time for repaint work and spraying MSC without it bubbling (it was 64F earlier, and currently 9pm with some sun still up and only 58F). 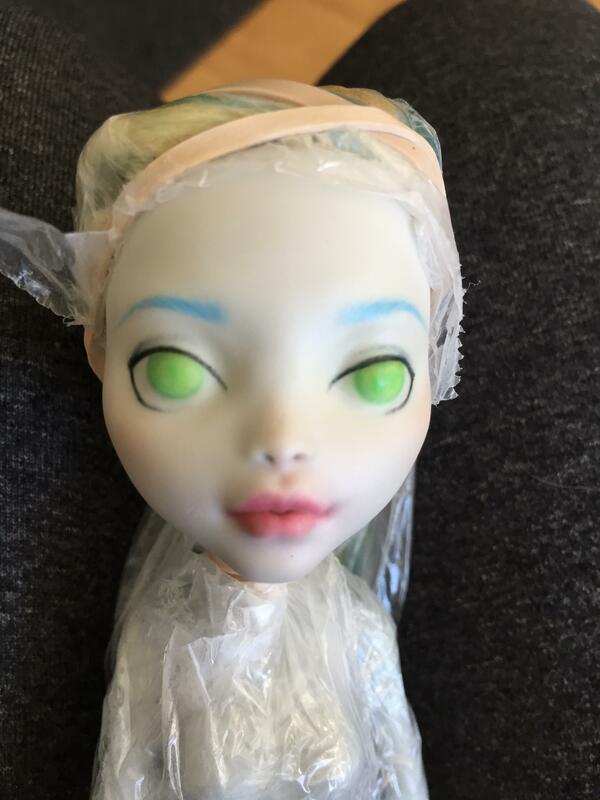 Lagoona's been waiting patiently for her new face, here she is all protected before and while the base layers of MSC were put down. I have a nice little balcony to do my work on, with minimal dirt/dust blowing onto the faceup. After the first layer of pencils and a bit of blush. Previous attempts have left a bit of staining on the lips and eyes, so I'm sticking with the same colors from those to minimize the risk of anything contrasting and looking odd. Round two of pencils. Building up the color and defining the eyes with black instead of grey-blue. Really happy with the brows! Eyelashes! 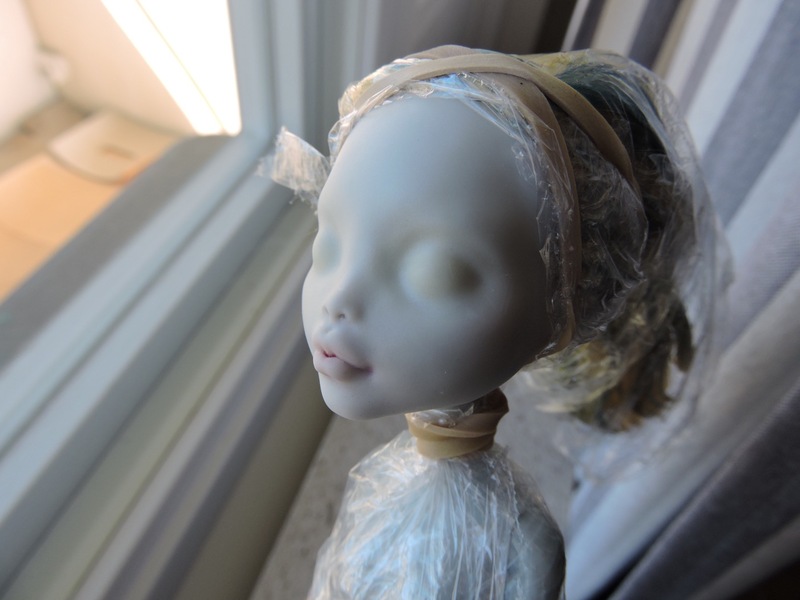 Having a really difficult time getting the white to stick on the eyes, so out she goes for another layer of sealant. It shows up well enough on camera, but in person and drawing it on feels like nothings happening. Maybe it's her skintone looking so similar to the white pencil? Pink doesn't really show up either though. Also having a tough time building up darker colors for the pupil, so hopefully when I pick up next the sealant will have given a nice layer for the pencils to grip to. You can remove the sealant/new paintjob with ethyl alcohol, actually! It's not as durable as the factory face-up, and the alcohol reacts with the sealant, like a solvent. Out of curiosity, how long are you waiting after spraying to work on her? How much are you spraying? And what kind of materials are you using for the face-up? I find that some of my pencils have issue with grip if I spray too heavily, particularly darker colours. This applies for pastels, as well, no matter what colour they are. As for white and pink, they're generally just a bit transparent and require more coats anyway. I usually use a very heavily watered down white acrylic paint to fill in the eye whites if I can't get the pencils on smoothly or opaquely enough. I prefer the acetone to nail polish remover or other options since it takes the factory paint off so easily, but in a pinch I can definitely purchase something less strong. I think these had like an hour between sprays and resuming work, though I think I may have gone a little heavy (trying to ensure the grooves in the eyes were sufficiently covered may have meant too much sealant was sprayed on). Pencils are Derwent watercolors, pastels were a rather cheap set since I figured I wouldn't be using them as much as the pencils. I might have to go with the paint, but we'll see how the pencils stick after this next round. It's just disheartening seeing the faceup channels and watching their whites go on so smooth and perfect and I'm sitting here like "Why won't the color transfer???" 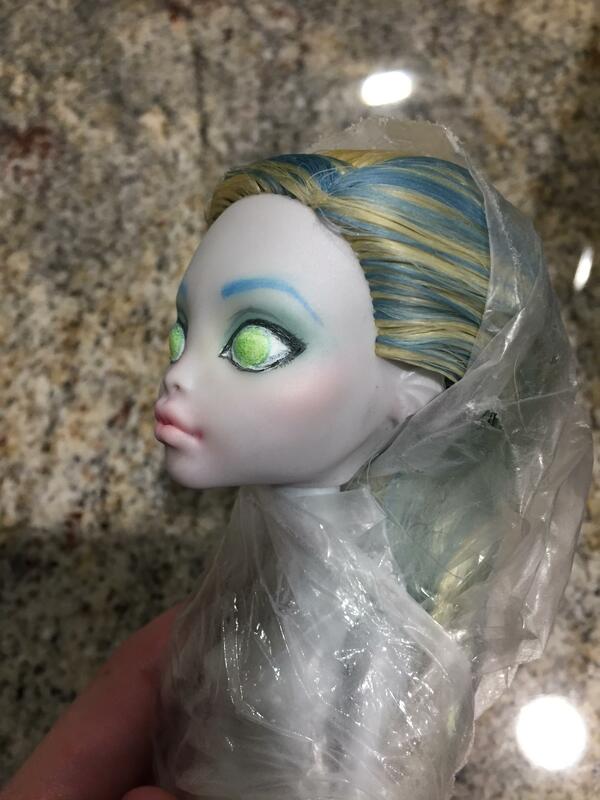 I'm hoping it's just due to Lagoona being such a pale doll, but I'll find a way to make it work! Wow, you've got some beautiful work done on her so far. Do you do other forms of art? Just some advice. MSC takes quite a while to fully cure (around 12 hours), so it is highly recommended that you wait a while between spraying and painting. 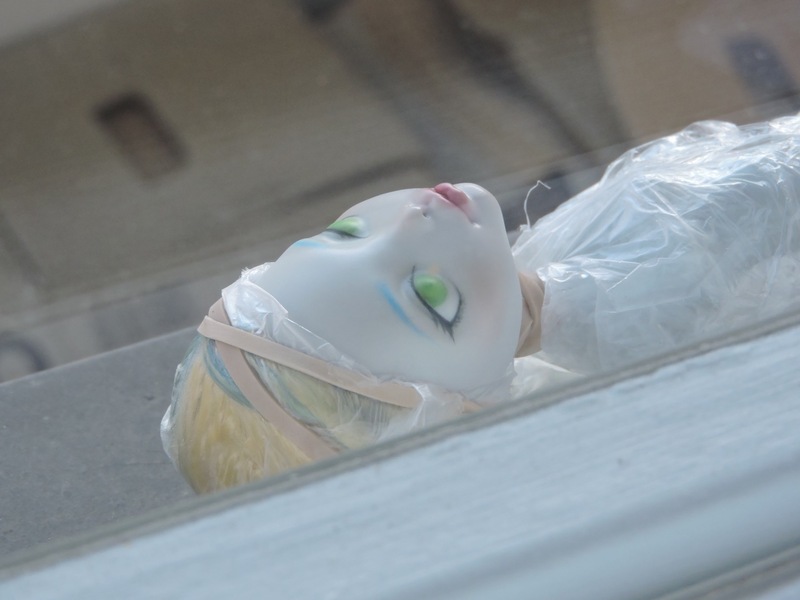 I know 12 hours seems like a bear, and for those of us who are impatient (like myself) you want to dive right into painting just as soon as the doll feels dry, but the wait is worth it. You'll notice the difference in how smoothly your pencils go on and how rich the color is if you give the MSC a longer dry/cure time before working. I recommend at least 6 hours if you can't wait the full 12. This craft is definitely a case of "slow and steady wins the race". Be very careful with how much you spray. A light mist is really all that you need. You want the doll to have a sheen, but not appear visibly wet. If it looks wet, you've sprayed too much; and too much MSC will build up and make painting that much more difficult. Not as much anymore, but I do draw; my avatar is actually a self-portrait from quite some time ago. Thank you! Thanks! I do have a hard time finding the right balance in spray amount. I left it alone from the time I made the large post until now, and the pencils are still not wanting to grip so I think I sprayed a bit too much; at this point it's probably best to water down some paint to try to get the scleras white like I want. And I'm going to call this faceup done! Sun's setting here so I couldn't get the greatest pictures right now, but I'm too excited and want to share! So for the future, I think I'll want to put the brows a bit higher and lengthen the lashes, and build up a bit more color variation in the eyes, snd lay down pastels on the eyes FIRST. I used like three or four greens plus green PearlEx powder, but it all kinda blends together, and the eyeshadow pastels got muddy pretty quick. The PearlEx on her eyelids and cheeks turned out nice though, and saved the pastel eyeshadow IMO. Her hair is also pretty bad, so I'm likely going to be cutting it all out and she'll be used for wig practice too. Beautiful! Love the eyebrows and lips, gorgeous! And THANK YOU for all the WIP pics and info. Love your 'crafting balcony' lol. My only thing is the black pupils seem a bit small, for how I like eyes. But otherwise truly a lovely Lagoona! That lip color is really pretty! And I think your cat did the best photobomb! Thanks DogMom! 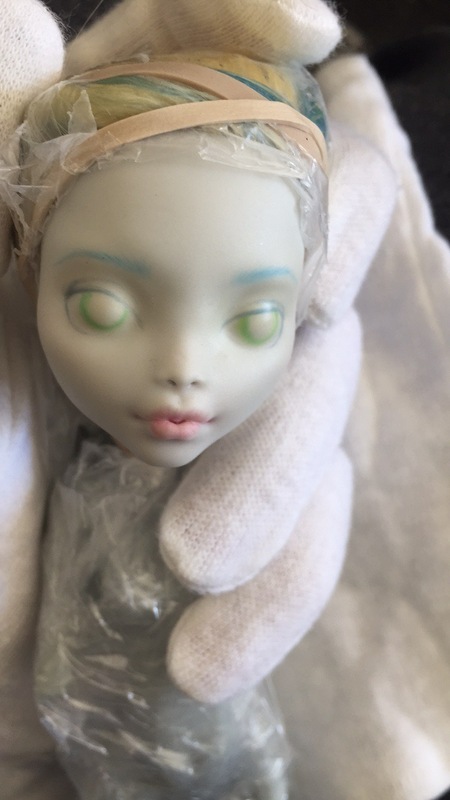 I'll experiment with pupil sizes; normally with my digital art I make the pupil somewhat small and surround it with darker shades of the iris color, but there's a big difference between how colors work on dolls vs. computers! 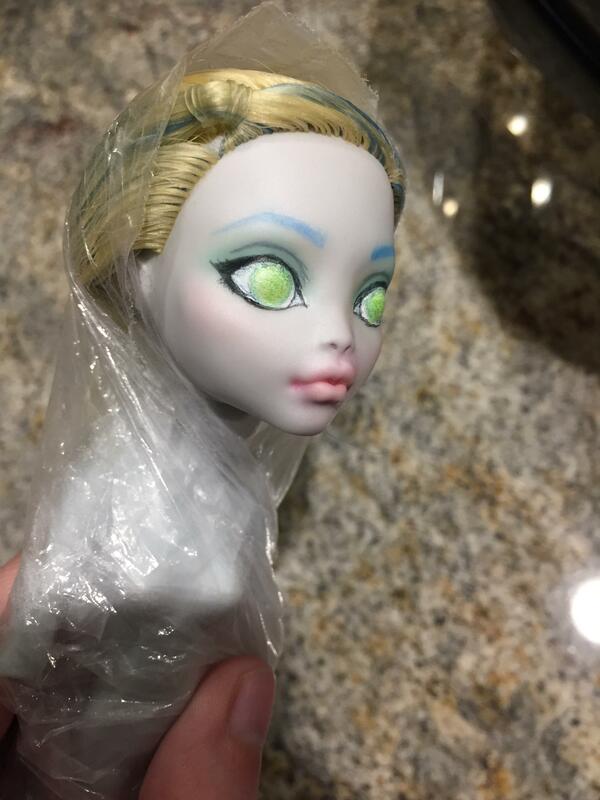 I also forgot to add white paint for eye highlights, so that's something for the next doll. Hoping to buy acetone today and get started on a few more. But who to paint first??? Thank you Konzern! It's a mix of pastels and pencils with a gloss applied on top, I like the way it turned out also! 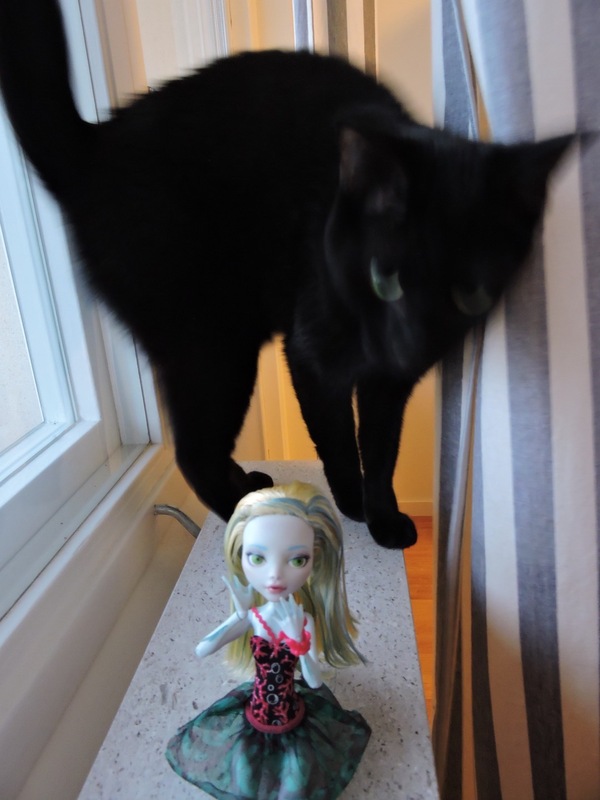 And yes, she doesn't photograph well but it certainly doesn't stop her from leaping into pictures anyways! edit: had some suggestions from some friends, one said Venus and Clawdeen, the other said Scarah and Spectra. I grabbed one of the Rochelle's since her hair was awful and I wanted to see if it was able to be saved, and I'll be taking on Clawdeen and Spectra as well. So excited! Started on Elle today while I see if Rochelle and Clawdeen's hair can be saved. Not looking too hopeful though, but at least there will be nice clean bald heads for the blank faces thread! Probably going to give her green eyes with gold lines to mimic computer chips, though I'm not sure if I want it fully green (like scleras too) or just the iris. Probably will quickly mock up both on my laptop and figure out which I like best. It looks really beautiful, like real lip gloss on her. Well, at least she isn't running off with them like mine does, I had to shut my loose ones away, Vetrix has some major issues with Venus! 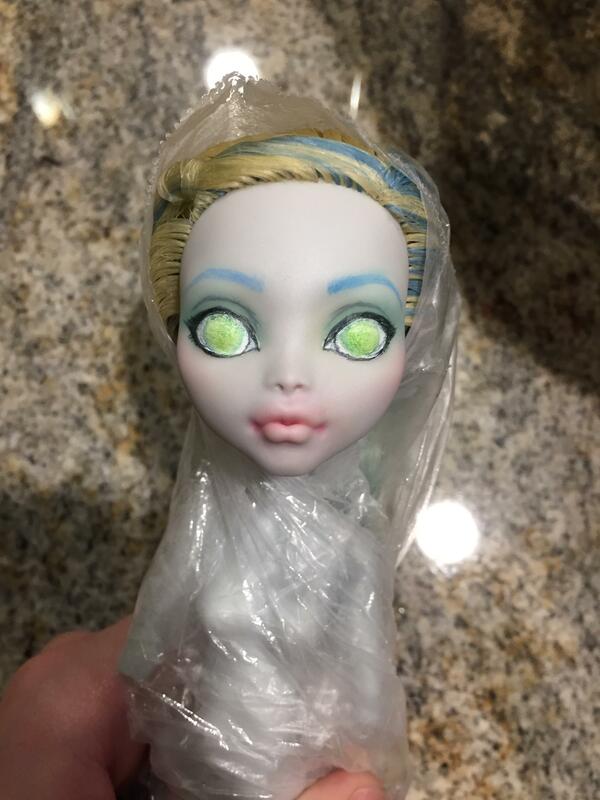 Elle's eyes sound really cool, I can't wait to see them!